Notes: The classic English double breasted suit, in a wonderful chalk stripe fabric from Huddersfield based mill, Dugdales Bros. This creation, by Henry Herbert Tailors, was made for Lord Herbert (pictured) – no relation to the firm, but, hopefully, a happy customer in his striking and well fitted suit. 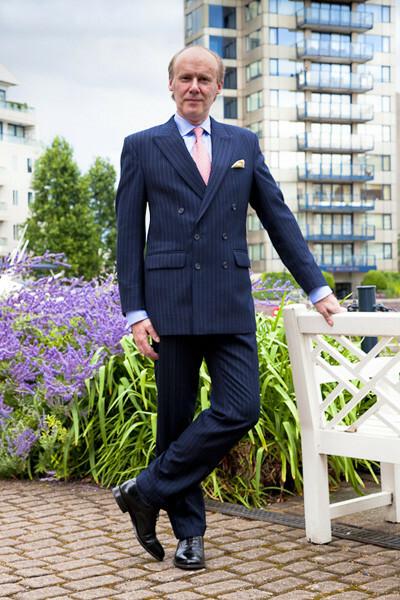 His choice of a navy chalk stripe cuts a dashing figure against the backdrop of Chelsea harbour in London. See also: bespoke outfitters, bespoke tailors, chalk, Chelsea, Double Breasted Suits, England, English, fabric, fabric source, flannel fabric, Henry Herbert, Henry Herbert Tailors, London, London Tailor, Lord Herbert, mayfair tailor, Savile Row Suits, Shirts, stripe fabric, suit. Lord Herbert Archives - Bespoke Suits By Savile Row Tailors.